Well, this is our last FORMAL week for color activities. We finished the cover of our Color Books on Tuesday. I got them stapled all together and will send them home on Thursday. For the cover I had all the colored stickers we used while making the books. I asked the children to find a certain sticker when I asked for the certain color. They did really well. The colors that I found were still a little vague were brown and black. I wasn't too surprised with the brown, but I WAS surprised with black. I am hoping to play a game with them on Thursday, I didn't get to it on Tuesday. I have a bag of different colored blocks. I am going to have them pull a block from the bag, tell me the color, then find something in the room of the matching color. Lots of fun! We will continue different reinforcement activities through the year: games, mentioning of the colors A LOT, a page for their ME BOOK, etc. When we come back in January we will be starting shapes during our skill time. For now, we've conquered the first task and have advanced to the next level--how's that sound for the video game age:). 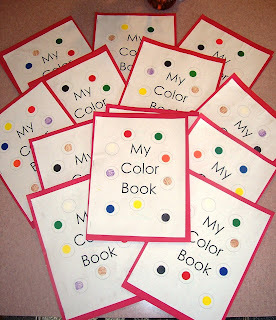 What did you put in your Color Books? Do you have a template? SuSu, I don't have a specific template. Each color had separte items. Red, apple & apple tree: Yellow, sun & tropical fish: Orange, pumpkin & fall leaves; blue whale & juggling clown; purple, teradactyl & Ernie's grapes; black, kitten & bat; green, tree & frog; white; snowman & igloo; brown, acorn & puppy. One page was a coloring and one page was a manipulative page. Hope this is helpful. Sorry I don't have more to offer right now.